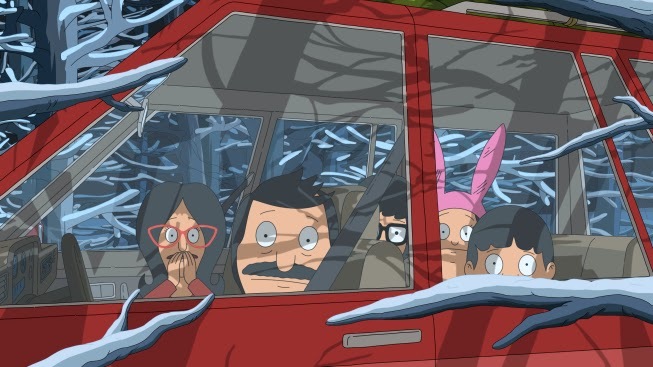 Only the Belchers would find themselves hiding in the woods on Christmas Eve from a trucker! and yet... I don't really find this show to be absurd. Sure, it's not realistic, but it's funny enough that I don't really care. Bob haphazardly taking over a class at the elementary school was also strange, but questioning it only removes the joy from the episode. Louise is confirmed to be nine years old, which is the age when I figured out that Santa wasn't real, so I completely believe that Bob is questioning how much his children still hold dearly. At the same time, however, Louise is easily the most street-smart of the Belcher children, and I'd bet on Gene being the one to follow his sisters' leads on ideas like Santa. It all makes me look forward to the next holiday on Bob's Burgers, though! Bob's Burgers "Christmas in the Car" (S04E08): Linda got a Christmas tree on November 1st, so it dies by Thanksgiving. She gets another one, only for it to die on Christmas Eve, so she insists that the family drive an hour to find another one at the last minute. [Why couldn't Bob have stayed home to look after the ham if he was so concerned?] It doesn't take long to choose a tree from the puny remainders, but the car then gets stuck in the snow. [interesting conversation where Bob is trying to get Tina to expose how much she and her siblings still believe about Santa Claus.] They block and annoy a truck, whom they later wind up racing on the road. The Belchers stop for a bathroom break after spinning out of control in Bob's fury, but they wind up waiting a bit on a Dutchy baby that Linda orders from a diner. [I totally want to try one of those now!] The delays force Bob to ask Teddy to come over and turn off the oven, but he winds up falling for the kids' Santa traps, getting stuck in the kitchen for hours. [haha, a preemie like Jesus!] Meanwhile, as the family heads for home, they run into the trucker again, and have to drive like a maniac to hide in the snow, getting the car stuck again. [cute Nativity diorama.] It's after midnight when the trucker finally finds them, and he wants to beat up Bob. But, giving them the tree and the Dutch Baby alleviates his issues, and Christmas is saved. the dutch baby.